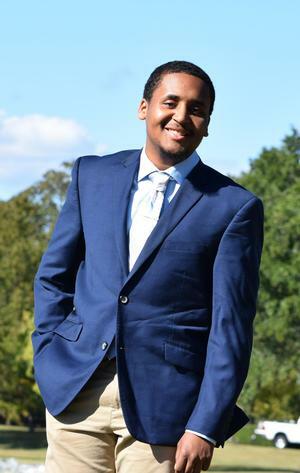 HAMPTON, Va. (November 14, 2018) – Carlos Mayers, Hampton University sophomore, Computer Science major, recently attended the Clinton Global Initiative University (CGI U) Class of 2018, which was held October 19-21, 2018 in Chicago, IL. The 11th Annual CGI U meeting brings together more than 1,000 innovative student leaders to make Commitments to Action in CGI U's five focus areas: Education, Environment and Climate Change, Peace and Human Rights, Poverty Alleviation, and Public Health. Through the CGI University Network, Resolution Project, Commitments Challenge, and other opportunities, over $750,000 in funding will be available to select CGI U 2018 students to help them turn their ideas into action. “Great job Mr. Mayers for being accepted into the program, and for attending this once-in-a-lifetime opportunity. Mr. Mayers represented Hampton University fully, and we are proud of his accomplishments thus far,” said Hampton University President, Dr. William R. Harvey. Mayers’ application to be part of the initiative was described as having “demonstrated a clear passion for change and a Commitment to Action that is new, specific, and measurable.” He spent the weekend on the campus of the University of Chicago, learning from President Bill Clinton, as well as many other incredible speakers. “It was remarkable witnessing history, and learning from President Clinton, Secretary of State Hillary Clinton and vice chair of the Clinton Foundation, Chelsea Clinton. This was a master class of a lifetime,” Mayers said. Students attended plenary sessions, working sessions, and other special events which enabled them to network with their peers, build skills, and identify potential partners. The program featured dozens of topic experts, university representatives, and celebrities who joined students to discuss effective solutions to some of the world’s most pressing challenges. During the last day of the meeting, attendees took part in a Day of Action in the local community. Mayers is involved with the Google Interview Club, on-campus Hackathons, and plans to be a global problem solver after graduation.